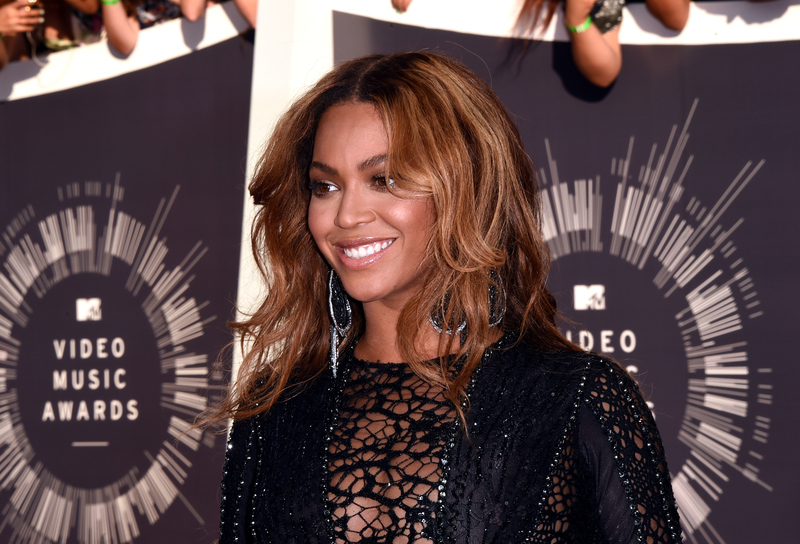 If you're watching the VMAs, you know that Beyoncé is going to take the stage very soon. (Or she better! We already had to sit through 5 Seconds of Summer. Gives us what we need, MTV!) But, if you just can't wait for Beyoncé's VMA performance and possible statement on those pesky Jay Z divorce rumors, then you're in luck. Beyoncé posted a sneak peek of her performance on her website, and the best way I can describe these photos is to say Beyoncé literally looks like the universe. Of course, this is Beyoncé we're talking about. If anyone should look like a freakin' galaxy, it's her. In the photos, 'Yoncé is covered in blue, purple, and silver glitter and tons of jewels. What does this mean? Is she's going to be naked with only glitter covering her?! That would certainly raise the bar of Britney Spears' scandalous snake dance of yore, but it definitely wouldn't silence any breakup rumors. Maybe the glitter will fall off of her forming a trail for Jay Z to follow and he'll come out in a sparkly suit and they'll renew their vows. Or perhaps the glitter really is supposed to look like outer space and it symbolizes Beyoncé being above the gossip. Who knows what the glitter really means — or if there will even be glitter when she finally hits the stage — but for now, enjoy these photos of a sparkly, mysterious Queen Bey. At least they'll distract you from Jay Pharoah's awkward quasi-standup routines.